According to its own information, the Museu del Modernisme de Barcelona (MMBCN) is the only museum dedicated exclusively to Catalan Art Nouveau. It opened in March 2011 as the Museu del Modernisme de Català and is housed in a Modernist residential and factory building built by Eric Sanier between 1902 and 1904. Simply enter the number of desired tickets and click on "Add to cart"
The MMCAT has an exhibition area of 1,000 m². On the ground floor of the museum there are mainly furnishings from the modernist era, such as cabinets, dining tables, wardrobes, office furniture, crucifixes, ceramics and other artfully designed everyday items. Here it becomes clear why the modernist era was mainly a middle class Bourgoise epoch: objects - whether for everyday use or as an object d’art - are all beautifully designed. Even at the end of the 19th and start of the 20th centuries the purchaser of such objects had to outlay a considerable amount of money. The furniture of designer and architect Antoni Gaudí, the most important representative of Modernism can be found on the ground floor as well. In an area of the museum dedicated specifically to him there are works that were designed especially by Gaudí for the decoration of Casa Calvet, Casa Mila and Casa Batlló. In the cellar of the former factory building, you will find the painting and sculpture collection. Works exhibited here are from some of the most important modernistic painters: including Ramon Casas - whose works, amongst others, defined the style of Modernism - Santiago Rusiñol, one of the most outstanding artists of the modernistic era, and Joaquim Mir i Trinxet who produced great modernist works. 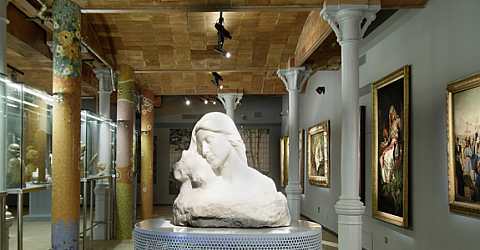 Significant sculptures are exhibited by Josep Llimona and Eusebi Anrnau, a sculptor who was also involved in the building process of Palau de la Música and Hospital de la Santa Creu i de Sant Pau. The museum collection consists of over 350 works by 42 artists of various disciplines of modernist painting, sculptures, furniture and decorative arts. The collection comes from the gallery owners, Fernando und Maria Pinos Guira and their Gothsland gallery. The architecture is not presented as independent and most obvious discipline of Modernism, although the museum itself is housed in a modernistic building. But the Eixample district, where the MMCAT is located, constitutes a veritable open-air museum with its huge variety of modernist buildings. The MMCAT does not show how Modernism in Catalonia differs from other forms of Art Nouveau such as the Art Nouveau / Fin de siècle in France or the Arts and Crafts movement in England. But the Museu de Modernisme Català provides a very good impression of what artefacts the Bourgoise middle classes were surrounded with in end of the 19th and beginning of the 20th centuries. You can also see how the work of modernist designers and artists differ: from Antoni Gaudí's organic, natural forms of being - to representatives of Modernism that are less well-known to the general public, such as Gaspar Homar i Mezquez with his straight and practically designed furniture. The Modernisme is omnipresent in Barcelona. Especially the typical buildings characterize the cityscape of Barcelona. The Catalan Art Nouveau style, however, is an art era that goes far beyond the buildings: sculptors, painters and designers also decisively shaped this period. In the MMBCN you can see what else makes Modernisme apart from the buildings. You see wonderful paintings, beautiful design and precious sculptures of the modernism. Schedule one hour for the visit. If you are interested more in Modernism we recommend the Modernisme Tour. Free admission without standing in line with the Barcelona Card.